I was very excited about one color in this palette- the second taupe brown one. But I was really (really) disappointed that it came out more reddish-toned instead :\. It's a deceptive shade, I tell you. 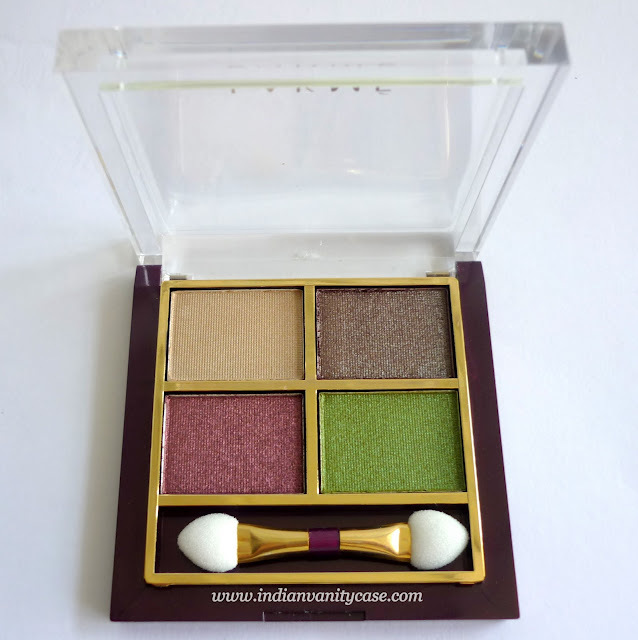 ♥ Very pigmented and blend really nicely. 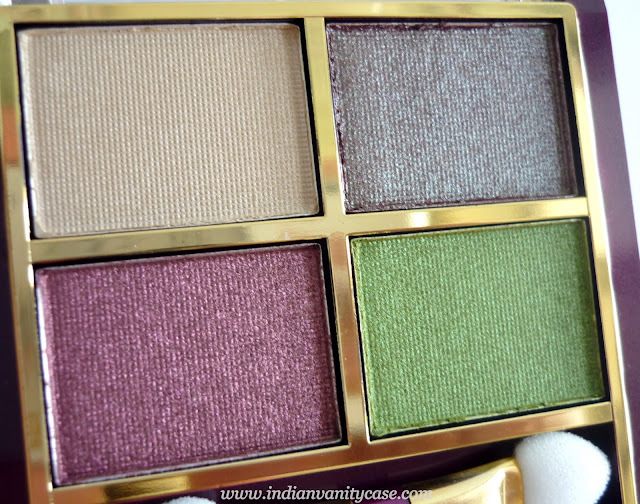 ♥ The green shade is really bright & pretty. Very flattering on brown eyes. 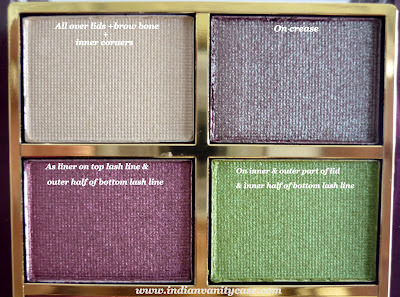 ♥ Beige shade is so versatile. It can be used as a face highlighter too. ♥ Sturdy packaging, although I wish it was prettier- maybe green, like the eyeshadow in it. It is also a little hard to open. ♥ Price. Rs.455/- is just about right for this. It's not worth more than that. - The petal pink/burgundy color is too soft and fall out a lot. - Sponge tip applicator. OMG I think I murdered it. One wash and it's gone. They shouldn't even bother making it anymore! Last words: I would have bought this eyeshadow quartet myself, because I really liked the taupe brown (not! ), beige and green shades. But after trying it, I think I'd buy it only for the green and beige. That looks pretty great!! finally a worthwhile quad from Lakme that is receiving good reviews!!! I am loving The green color..but i recently purchased the 88 palette..so i guess i will skip this quad from this collection and instead go for the lippies and blush,i guess...!! 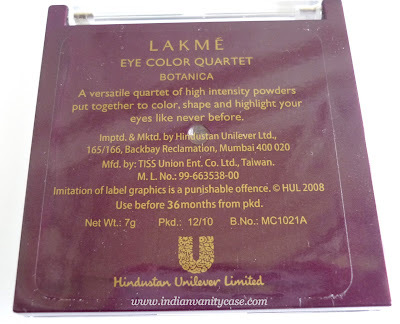 ur EOTD is outstanding CZ !!! u knw exactly how to work wit colors.. 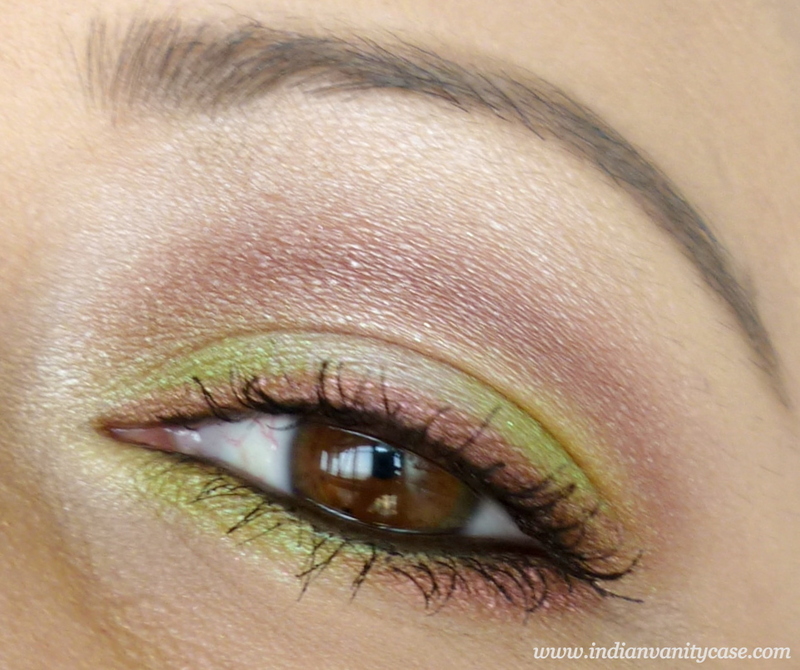 I am so amazed by the way you have mixed and matched all the four colors, the EOTD has come out beautifully!! colors look quite different on the eyes vs on the pallet! rashmi- haha..ur too funny! Really? One lady said that??!! She's mad then lol. Been through the same thing with brown in their Gypsy collection. Major disappointment. I'm still searching for a good shimmery brown. And i mean 'Real' brown! 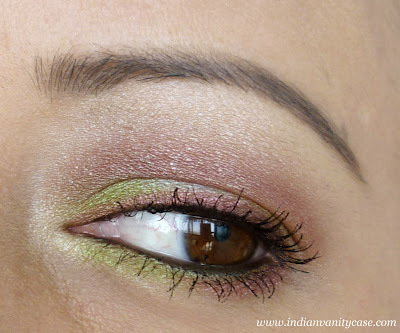 Love your eotd and that green and beige colour makes it all worth buying the whole quartet.